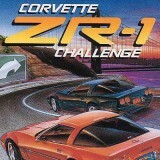 Corvette ZR-1 Challenge : The crowd salutes you and they want you to win the race. However, the second driver is experienced and this race won't be easy for you. Get into the car and prove you are the winner.